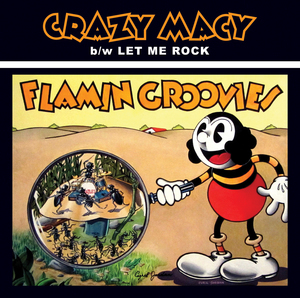 To celebrate their 50th anniversary, we're finally re-releasing the new 7-inch vinyl single “Crazy Macy” by legendary punk forefathers and powerpop pioneers the Flamin’ Groovies!! Originally released by Burger Records for Record Store Day (April 16) and went sold out quick, now it gets a re-release with new vinyl cutting and brand new cover artwork by Dennis Loren. Additionally, the single will feature the B-side "Let Me Rock,” which was the first track penned by Jordan and Wilson in the early '70s but was only officially recorded recently. “'Let Me Rock’ is the very first song Chris Wilson and I ever wrote together… right when he first moved in with us in my mother’s house,” Jordan recalls. Limited edition of 1000 copies, 100 on colored vinyl (lime yellow! ).